#1 - MY NEW NIECE! My amazing sister-in-law gave birth to a little girl this past week and our family is just ecstatic over this news. Lots of phone calls to and from Texas this week and we're just thrilled for my brother and SIL (and nephew!) I love being an aunt. I'm especially thrilled because our two daughters (that's right! If you missed the news - I'm havin' a girl also!) will be just a few months a part. It's delightful to be able to think of our children growing up together. Very happy here. Very happy. #3 - GOODWILL! Ok, I confess it. I'm a Goodwill junkie. I like popping in on a regular basis to see what they have. We have a really good store here in town and I can occasionally stumble across some really great deals. For example, the other night when I was feeling the urge to shop for our own baby girl, I went to Goodwill and found a stack of brand new, sometimes never-been-worn-before dresses and outfits and loaded a bag for a mere $24 bucks. Awesome deals. $5! My jaw dropped. I came home and checked eBay and they are going anywhere from $15-$75! Mine, however, will not go on eBay. I had fun relieving my past and introducing my little Bookworms to the glories of 1971 Preskool toys. #4 - Christmas. Oh wait. I already said that! #5 - Facebook. Ok, what!? Stop the presses here. Yeah, I said Facebook. Well. I'm listing it as a favorite more in good faith than anything else. I actually rather dislike it for the most part. I can cite a list of reasons why but I'll spare you (for now.) Some parts of it are peculiar and interesting to me. That said, I've *gulp* created a Facebook Page for Reading to Know. If you're on Facebook you can "like" me on the Reading to Know page. Or you can not like me. That's entirely up to you. (I'm not going to be taking up any Facebook offenses anytime soon.) I will say though that I do have privacy concerns and if I think Facebook is interfering with my family's safety or taking priority over them, I'll drop it like a hotcake. As I said, I'm trusting that this page can be created in good faith and in good fun and it will be a pleasurable experience. If you decide to like it/follow it/or whatever it is you do with FB, then you can keep tabs on the site AND I also plan on using it to point out other articles/blogs/resources/quotes/things of import that I don't have the time, space or room for here on the site directly. We'll see where it goes. And that, my friends, is that! I hope you all have a fantastic weekend doing whatever it is you are planning to do. I loved my fisher price record player :) that is awesome and in such great condition!!! LOVE your list and I'm with you on facebook I have a fan page but never do anything on it I need to be better about that. I'm a twitter girl. My kids loved that record player when they were little! Congrats on your new niece! I had cousins my age -- so much fun growing up together! I guess I'm the last one standing outside the FB door! :-) Good luck with that venture. 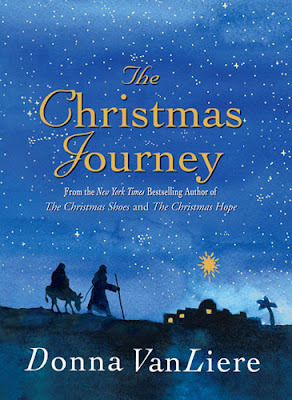 The Christmas Journey is one I looked for, but it was checked out. I'm going to keep trying though! Congrats on having a girl- I love baby girls! Of course, someday you might have to marry her off ... and that is expensive and hard work ... just sayin'! And having a cousin your own age is very special! Love the Fisher Price record player. Yours looks in great condition. Congratulations on your new niece. Having cousins in the same age range to play with is so much fun. They're what I had while growing up an only child and I'm thankful. Have a great weekend. I still haven't found my way to facebook. Don't know how I feel about it. LOVE the record player. Can't wait to see your decorations. I wish we had a "good" thrift store in town. We have one, but it's not so great. I am thrilled for my friend today...about 7 weeks early, but she had her twins today. And they are doing pretty well. Can't wait for my two sisters to have their children...and YOU! What happy news! It's exciting to have a niece and a daughter who are close in age! I don't think we had the same record player, but we might have had something similar. It looks vaguely familiar. I like you on Facebook! I'm relatively new to FB, as well, and I'm keeping the personal information OFF of the site. 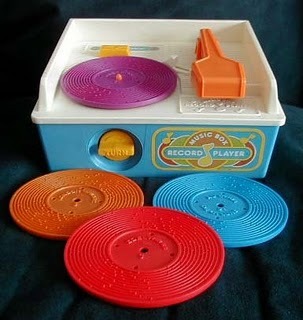 Wow, I had one of those fisher price record players, thanks for the memories. Congratulations on being an aunt and soon to be. It is great for cousins to grow up together. I just picked up A Christmas Carol today my daughter recomended it so it will go into someones stocking. I also picked up The Phantom Tollbooth by Norton Juster for my nephew, I loved this book. How fun to have a new niece. Congratulations! Those days are over for me, so now I’m enjoying my nephew’s having a baby. It’s fun being a great aunt too. What a great Goodwill find. We go to our local Goodwill periodically too. Just "liked" you on Facebook! Have a great weekend. I love Goodwill as well--and I've been popping in more recently lately as I'm looking for a china cabinet. Unfortunately (or perhaps fortunately, depending on how you look at it), I find myself emerging with any number of inexpensive items (clothes, books, things I want for my home)--but not with a china cabinet. Sigh. Congratulations on the wonderful news that your are getting a daughter! Daughters are wonderful. Congrats also on the birth of your niece! I hope the girls get to spend lots of time together! What a great find at goodwill! I do remember those things but don't tell anyone that I'm that old! You find the best stuff at that store! I only find junk at the one I go to. Congratulations, Auntie! It will so much fun to have the TWO little girls growing up at the same time. I enjoy facebook too although I'm not on there much. Hurray for great finds at Goodwill! well, I didn't have that one, but I recognize it! We had one that played "real" records that were small and were read along stories.